Along the year 2015 I created a trainer status page on my website dedicated to the Prime Love Peace Campaign ( The All You Need is Love site ) in which I welcomed women interested into a collective love relationship that follows the Nordic Star model, one man with 3 to 9+ women along Spring 2015. But I changed recently Nov-Dec 2015 my status into not single, committed in a monogamus love relationship with my twin flame. The change of my status is profound in terms of its meaning and implications for my life path and body of work. Since I met my twin flame, my journey changed its destination. This unique experience of completion made me realize the importance of empowering love relationships within this pattern/twin flame love relationships, as it is more suitable for the needs of our time supporting peace, family structures, culture care, life care and heritage. Everyday Prime Love Teachings have been upgraded since my twin flame and I met, and I expect this speed of changes and upgrades to continue. Joelle-Marie & myself have also designed a new life path as a couple and family and we are very happy about it. Both of our past working experiences went through a wonderful transformation and upgrade since Joelle-Marie and I met. Each of us have been developing along our whole life precisely 50% of the work necessary to complement each other through our encounter. The new series of products, that we are designing, will be a lot more beneficial to the world, now with our forces combined. As a twin flame couple we will create the imprint we both wish, empowering love relationships and family as foundations for peace, cultural upgrades, life care and heritage. Now just to inspire you with a few details and insights about the nature of our work. Joelle-Marie and myself will teach, train and advance the skills of all the team members as well as monitor and support their learning process together. At this stage of our work in Prime Love we would like to build up a crew with Prime Love abilities as our trainers and coaches with project management skills. Once you meet your twin flame, there is not much room for doubt.. The balance and waves of energy a twin flame meeting creates is quite enormous. Be aware, that an imbalance within one of the twin flames also creates similar patterns inside the other and can impact behavior and choices made by each of the individual twin. In this new age of awakening on planet earth most of the twin flames agreed to meet each other now, as this will help the planet to upgrade much faster. If twin flames also work consciously on spiritual realms together, the effect is profound and felt by everyone involved. Purification or purity in itself is therefore immensely important to create a global balance between multidimensional realms and the now, on this planet. Every imprint , sexual or not, must be contained to focus only on the twin to heal and develop a clear life’s purpose, which should be aligned to the source of love and all that is ~ have been and will be. These twin flame purposes would usually create an intense upgrade not only in their lives, but in all the lives they touched and the earthian realm itself. To empower someone to be exclusively available to the imprint of their twin flame is a big commitment and asks discipline, which not everyone is willing to give. Prime love will be upgraded to fit this concept of twin flame purity and some of the practices will be, in terms of this adjustment, only available for customers, who found themselves being a twin flame couple or willing to find their own twin flame in the near future. This place of being reflects the state of consciousness you are in and therefore only those who did find their other half or are very determined to find their twin flame, are able to join the higher levels of prime love practices. We would like to inspire you with this brief introduction to Prime Love Upgrade for Twin Flames to join us along the Journey of Prime Love. Netherlands – Finland, 2015. Nov-Dec.
PS. 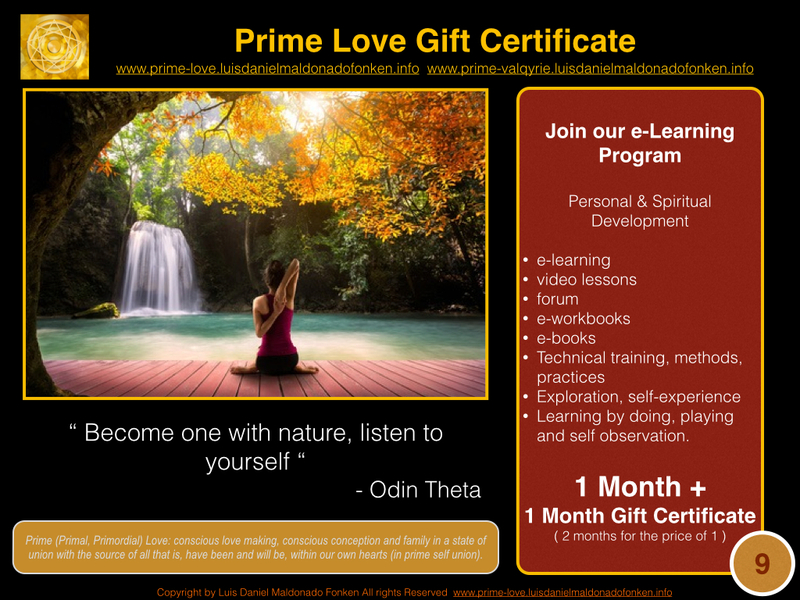 Thanks to the presence of Joelle-Marie Prime Love, Prime Tech Theta, Prime Yoga and Prime Peace are experiencing an upgrade now.